There are shackles binding John Byrne’s creativity at this stage: not only is he still spending around 10% of his time sending love letters to Stan and Jack (His Galactus epic contains a story title “Shall Earth Endure?" the exact same title as #77, which was also an instalment in a Galactus tale. #74 also goes by the title of “When Calls Galactus", which isn’t the actual title of #244, but does make it to the front cover) but he’s also constricted by having to tie up loose ends. So it is a throwaway end panel with Medusa captured from 33 issues, 2 years, 9 months and three writers earlier is finally resolved, as is the secret of Frankie Raye. Raye? She’s Johnny’s on-off girlfriend, which John cleverly rewrites as someone with whom Johnny has had an unseen relationship with, rather than the reality of someone who was introduced and discarded by writers, a character forgotten when Johnny spent the Moench issues dating Lorrie Melton. Still, if anyone can forget the history of what took place post-Lee it’s John, and so we get Raye reconfigured as a flame-crossed lover for Johnny. As a she-Torch, and also a follow-up to Fire Lord as a Galactus herald, it’s marginally less silly than the later She-Thing of the same decade, but this is still a title that seems to not be allowing John to have his own voice… yet. Innovations in the run include the FF finally opening a public reception area (peopled by the android Roberta, unnamed here) on the floor below their headquarters, and the Thing reverting back to an earlier, lumpy form. There are also innovations within the issues, like having two stories in one (#238) or toying with the occurrence of the splash page. Perhaps most notable is the way John shifts attention away from the group’s powers. Often they’re given an enemy that can’t be defeated with their powers (#239), have their powers stripped away (#241), have enemies so empowered that their own are rendered virtually useless (#245, #249) or even have no enemies to speak of at all (#238, #240). Possibly the biggest change is a subtle one from the November issue (a change that runs up until #295) involving Johnny, Sue and Franklin. I’ll just say “collars and cuffs" and leave it at that. Stories contained in the run include the part-inspired, part-dreadful “Wendy’s Friends", where a group of extra terrestrials judge a townsfolk, including a child beater. Probably better than I’ve rated it is the Galactus trilogy from June-August, which isn’t bad storytelling, but none of it – from Frankie Raye’s paper-thin motivation to Galactus waxing lyrical about the nature of friendship – rings true. There are also occurrences of stilted writing, of which “Realisation blooms like a dark rose in Susan’s mind" has to be high on the list. Probably one of the least successful elements of Byrne’s repertoire is the depiction of the Inhumans. I’ve never been particularly fond of the characters anyway, but in John’s hands they’re even more lacklustre, particularly the deeply tedious #240. John plays games with narratives, including having his first three stories of the year largely villainless, and without physical conflict. It works, in parts, but with an entire story just there to uproot the Inhumans’ city (“I resent him tampering with so much of the legend. In the space of a couple of months, he's taken care of the Inhumans and moved them to the moon; he's taken care of a couple other things like that. It's really very imperious to suddenly decide to change so much that is integral to the whole Marvel mythos, as opposed to just a supporting character in a book." – Len Wein, interviewed by writer Jay Zilber in December 1981) it does cast doubt onto the validity of it as a story in and of itself, particularly as elements are swept under the carpet, such as what actually happened to Medusa and how she escaped in the first place. I’m also curious as to why the narration should read “Amen to that!" when Crystal’s daughter is born human and not a mutant or Inhuman. One topical plus of the story is that, while pollution had been brought into their story as far back as 1970, John crafts a tale where nowhere on Earth is habitable for the Inhumans. Two years into the future and the stories of the hole in the Ozone Layer would be big news. Yet by far the worst book of John’s run, pre-1986, features a crystal-induced nightmare in Triton’s mind (#248). Though John would later explore such themes to vastly greater effect in his Psycho-Man tale, what is effectively a non-story plays out and ends with a twee morality pitch. One of the most heavily-criticised of all John’s stories, it caused the debut of one of the semi-regular letter-writers of the period, the wonderfully-named Joe Frank. (“I’m almost tempted to subscribe – just so I could cancel out!!" – Joe, FF #305). Of the six calendar years that John was in control of the Fantastic Four, then 1982 was almost the weakest of them, save for ’86 when John’s creativity on the title seemed to be exhausted. However, while 1982 wasn’t a golden period for the FF, it still had much to offer. #249 saw Gladiator, a Skrull protector clearly styled on Superman that had the power to KO the Thing with a single punch in a superficially entertaining action issue. 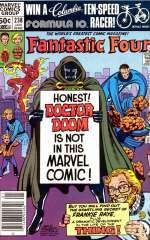 Perhaps most notable of all was the two-part Doom story that saw the FF have to aid his return to power in Latveria, realising that the rule of a tyrant aided stability more than the relaxed rule of Zorba, the man they helped appoint to power back in 1978. Look out for references in these issues to Dazzler #10-#11, Rom #26-#27, The Avengers # 215-#216, Micronauts #41, What If #30 and The Uncanny X-Men #137. 2019 - New year, same old stories? Johnny returns; Hickman's arc ends. Johnny dies; Spider-Man joins. Volume 4 begins. John Bryne's final issues; Ben rejoins the team. Sue's miscarriage; Secret Wars; Ben leaves and She-Hulk joins. 250 issues, plus the FF get new costumes. Galactus returns; the Inhumans relocate to the Moon. Sue's invisible force field, Diablo.. and it's clobberin' time!